Saturday six blackmouth salmon hit our artificial baits. Some of the fish were shakers, others were nice “keeper” sized immature Chinook salmon that measured over the legal minimum of 22 inches. Two nice sized fish hit, striped line and eventually got off our barbless hooks. We kept two fish and brought them back to John Wayne Marina’s cleaning station. First order of business, open the stomach and see what the fish were eating. Not surprisingly, their stomachs were filled with two to three inch little “poggie” like baitfish, tiny shrimp and baby squids. Sized 2 Kingfisher Silver Horde, Gold Star Salmon Hooks Match The Hatch When Salmon Feed On Small Baits. Yesterday I visited Kelly at Silver Horde. We’ve known each other for more than 30 years and during that time visits to their Lynnwood Washington store has always brought a smile to my face. My reason for visiting was simple — replace some items not available locally. Specifically, downrigger rudders. Over the years these rudders have accompanied my downrigger balls and helped attract more fish. Anglers always ask me, what is that thing on your downrigger ball? My answer, it’s a fish magnet! LFS (Lumi Fishing Supply) in Bellingham Washington custom designed the color of this awesome looking Silver Horde downrigger rudder. 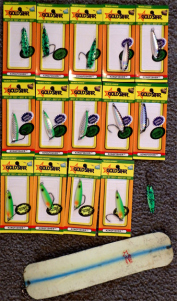 They will be available at the LFS booth at the Seattle Boat Show. Today I tried one and it worked great! Winter blackmouth fishing can be a challenge, especially if you don’t know the area. After moving to Sequim two years ago I began the fun task of learning new waters, specifically the Protection Island area. This great area is close to John Wayne Marina and offers some protection from wind. The chart above shows the prime areas to fish Protection Island. The finger that extends from the SW side of the island holds bait which in turn attracts hungry blackmouth. A few anglers jig the area on an outgoing tide. 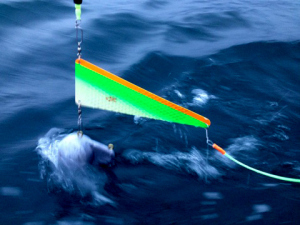 When jigging start at the inside of the finger, in shallow water, which drops into the deep. During a perfect tide the drift will carry your boat across the prime zone marked in yellow. Trolling mini FAT Squids at Protection Island works great. Orca Adventure Lodge in Cordova Alaska provides Alaska’s best river coho fishing. 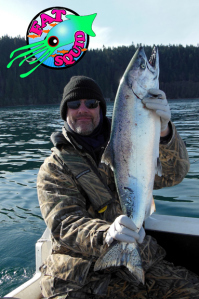 For more information about Orca Adventure Lodge please visit http://www.cordovafishing.com and please visithttp://www.gofishmagazine.com to sign up for your free online fishing magazine subscription.